The first choice made by the editors is to deal only with Eurpean law in the sense of the primary law of the European Union. The law of the Council of Europe and the European Convention on Human Rights are therefore not envisaged. Secondly, the book has deliberately discarded the secondary law of the European Union: regulations, directives and decisions in particular. While the first exclusion is explained by the fact that the European Union is a self-governing legal system, worthy of interest in itself, the second exclusion is more arbitrary. Indeed, in the field of private law (see definition below), primary law occupies a marginal place compared to that granted to secondary legislation. This arbitrary choice makes all the originality of the project. The objective pursued by the initiators of this book is clearly to show the community of lawyers, especially the private lawyers, what they too often omit in their analyzes: the application of primary law in a horizontal situation. This primary law is composed of the following major blocks: competition law (essentially the law of anticompetitive practices, Articles 101 ff TFEU), the fundamental freedoms of movement (goods, services, capital and persons (Articles 26 ff (TFEU), the general principle of non-discrimination (Article 18 TFEU), the general principles established by the case-law of the Court of Justice on the basis of the Treaty (effectiveness, legal certainty, proportionality, abuse of rights, unjust enrichment etc. ), which nowadays must be viewed in relationship with the Charter of Fundamental Rights of the EU, the ECHR and national laws, the rules laid down by the case-law of the Court of Justice on the basis of the Treaty concerning the horizontal applicability of directives (Article 288 TFEU) and concerning the ex officio operation of European texts by the national courts. In relation to all these rules and doctrines of primary EU law this book focuses on their application in ‘horizontal’ cases. This choice further tightens the object of the research, as primary law is most often applied in a vertical situation, e.g. in a situation involving State public authority (or its dismemberments), whether in its relations with the EU or in its relations with individuals. Here the choice has been made to focus the analysis on the application of European primary law between two or more persons in horizontal relationships. These are not necessarily relationships of private law. One can perfectly imagine situations where the rule of public law comes into play in a horizontal relationship, most often alongside other rules of a private law nature. But for simplicity of language and (presumably) editorial choice, the horizontal application of the primary law of the European Union appears here under the label ‘Private law.’. In order to deal with this somewhat singular application of European law, priority is given to national jurisprudence. The provisions of primary law and the major cases of horizontal application which can be found in the case-law of the Court of Justice are the subject of succinct analysis. The bulk of the comments are devoted to cases of national jurisprudence applying European primary law. This choice, quite original, pursues the objective that commands the whole work: letting lawyers see a reality of application of European law too often ignored. The decryption of all the concrete situations in which this application of European law takes place occupies a primordial position in the work. It is a question of understanding very concretely how the phenomenon is materialized in the relations of private law and how, from a more theoretical, not to say epistemological point of view, it is of a nature to recast the usual constructions and analyzes. The presented cases offer a wealth of information for researchers who would like to go beyond a very classical reading of European private law. Another objective pursued by this systematic presentation of the national jurisprudence of the Member States is, of course, comparative analysis. From one Member State to another, the application of European law is not, whatever one may say officially, the same, far from it. More and more books/studies are dedicated to this differentiated national application of European law. The book takes part in this more general movement. In order to deal with essentially national cases of horizontal application of European primary law, a preliminary grid has been given to the contributors. This reading grid, taken up in the first chapter of the book, constitutes a real roadmap. It is the work of Professor Arthur Hartkamp, ​​who has systematized and theorized two major figures of application of primary European law in horizontal situations: direct application and indirect application. The first concerns the hypothesis that European law has an immediate bearing on the contents of of private law relationships between two individuals. The second concerns the circumstances in which European law modifies, inflects, enriches the traditional game of rules of national private law or, more rarely, international law. This double effect has the peculiarity of being applicable to all the constructions of primary law which, depending on the situation, develop both direct and indirect effects. This work will have achieved its objective if it succeeds in convincing the community of private lawyers that it is not possible to work on European private law without a thorough knowledge of the core European legal reactor which is the application of European primary law. The main texts of EU law, the major judgments of the EU Court of Justice are the starting points in this book. The link is established between these basic resources of European law, which are essentially foreign to private law matters, and horizontal situations, in particular private law situations. 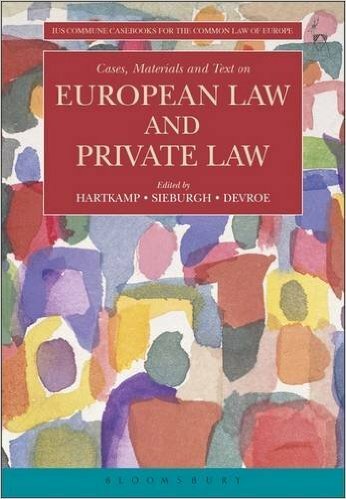 It is this connection between these two constructions of European and private law that makes it possible to establish the existence of a European private law. Not to see it, not to talk about it, is to take the risk of missing the matrix of European private law. the academic team composed by the editors of the book from the universities of Nijmegen and Leuven is: Ilse Samoy (Belgium), Roel van Leuken (Netherlands), Jerzy Pisulinski (Poland), Anna Maria Mancaleoni (Italy), Ulf Bernitz (Sweden), José Caramelo Gomes (Portugal), Balazs Fekete (Hungary), Jeremias Prassl (United Kingdom) Caroline Cauffman (Belgium), Sander Van Loock (Belgium), Oliver Riemen (Germany), Marloes van de Moosdijk (Netherlands), Blandine Bonnamour de Clavière (France) and this author.